Viruses have been linked to approximately 15 to 20% of all human tumours world-wide and their empire is expanding over the years. While histopathology and cytopathology have been utilised for decades to arrive at a tissue diagnosis of cancer, the advent of newer and more sophisticated ancillary tools have thrown light on the aetiology of neoplasia including virus as one of the causes. 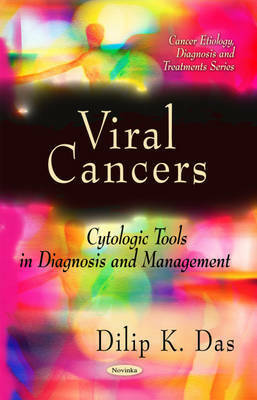 Whereas in occasional cancer, it is possible to observe the cytopathic effect of virus in cancer cells or their precursor lesions, in most malignancies there is so far no morphological clue to their viral aetiology. However, morphological diagnosis continues to be important for the management of malignancies and cytologic tools is a simple and largely non-invasive tool for collection of samples for various ancillary studies. This book deals with the classification of oncogenic viruses and the diagnostic tools utilised for the cytodiagnosis of cancers likely to be caused by these viruses. The role of cytology in diagnosis of malignancies caused by human papillomavirus (HPV) and human polyomaviruses is also discussed, as well as the malignacies caused by Epstein-Barr virus (EBV) and Kaposi sarcoma herpes virus (KSHV). The book concludes with a discussion of possible future developments in this field.